Venice MainStreet, Inc. is holding a contest for the 28th Annual Downtown Venice Art Fest official poster design. The artist selected by the Design Committee will be awarded $500 for their design, along with a booth at the festival ($500 value, for a prize package worth $1,000). The winning design will be featured as the official poster, which will be showcased on merchandise* and in advertising**. The winner will be expected to be available for an unveiling event on the evening of Wednesday, November 4, 2015. Original (unframed) artwork must be delivered to Collector’s Gallery and Framery (114 South Nokomis Avenue) by 5pm on Saturday, September 19, 2015. The winner must also submit a high-resolution editable, working digital file (for poster and merchandise production). Finished poster size will be 22 x 28 (original does not need to be the same size). Image must include at least one of the Venice bridges. (Copy that will be incorporated into the poster/merchandise will include “28th Annual Downtown Venice Art Fest”). 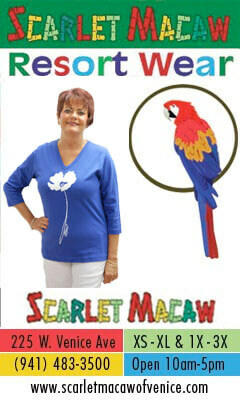 *there is a possibility that the design will be showcased on other merchandise, along with the t-shirts. Celebrating its 28th year in 2015, the Downtown Venice Art Fest is one of the area’s largest and finest art fairs. Thousands of visitors kick-off season with this Howard Alan event that takes place along Venice Avenue in beautiful, historic downtown Venice. 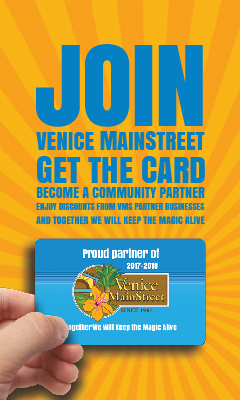 For more information, please call Venice MainStreet at 941.484.6722. Find out more about Howard Alan Events at www.artfestival.com.